This week’s posts are excerpts from Chapter 23, "I Lost My Parent", from our book, Lost My Partner – What’ll I Do? Revised and Expanded Edition. Losing a parent, indeed, both parents, is to be expected in life. When this happens though, it can shake your world in ways you never anticipated. While you’re feeling abandoned (no matter how old you are) by your late parent, it’s natural to turn to your surviving parent for comfort and reassurance. 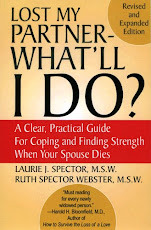 You may discover, however, that he/she is unable to provide support because of his/her own grief. Their preoccupation and withdrawal can feel like one more abandonment. a) Becoming excessively anxious about your surviving parent’s health and/or safety. b) Trying to assume the role of your late parent by taking over many of their tasks and responsibilities. c) Pressuring your mom or dad to quickly dispose of “painful reminders” or sell their home right away and move closer to you. d) Becoming impatient, annoyed or angry with the way your parent is coping with the loss. e) Expecting your own spouse or partner to always be supportive and understanding of your situation. f) Quarreling with your sibling(s) over who does what or who gets what. In addition, you may struggle with guilt, remorse or other emotional unfinished business from your late parent’s final illness or circumstances of death. In Part 2, we’ll help you understand changes in your relationship with your surviving parent.